S. Alers, D. Bloembergen, D. Hennes, S. de Jong, M. Kaisers, N. Lemmens, K. Tuyls, and G. Weiss. Bee-inspired foraging in an embodied swarm, Proceedings of the Tenth International Conference on Autonomous Agents and Multi-Agent Systems (Demo Track), 2011. W. Brauer and G. Weiss. Multi-machine scheduling – A multi-agent learning approach. 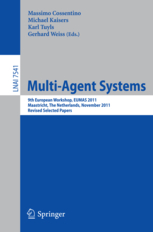 In Proceedings of the Third International Conference on Multi-Agent Systems (ICMAS, pp. 42–48). IEEE Computer Society. 1998. S. Chen, H.B. Ammar, K. Tuyls and G. Weiss. Conditional restricted Boltzmann machines for negotiations in highly competitive and complex domains. Proceedings of the 23rd International Joint Conference on Artificial Intelligence (IJCAI, pp. 69-75). 2013. S. Chen, H.B. Ammar, K. Tuyls and G. Weiss. Automated negotiation based on sparse pseudo-input Gaussian processes. 25th Benelux Conference on Artificial Intelligence (BNAIC, pp. 307-308), 2013. S. Chen, J. Hao, S. Zhou and G. Weiss. 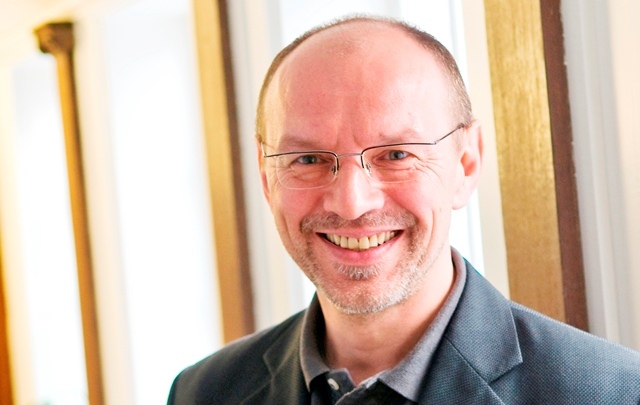 Negotiating with unknown opponents toward multi-lateral agreement in real-time domains. In K. Fujita et al. (Eds. ), Modern Approaches to Agent-based Complex Automated Negotiation (pp. 219-229). Studies in Computational Intelligence, Vol. 674. Springer Verlag, 2017. S. Chen and G. Weiss. An efficient automated negotiation strategy for complex environments. Intern. Journal on Engineering Applications of Artificial Intelligence (EAAI), vol. 26, issue 10, pp. 2613-2623. 2013. S. Chen, G. Weiss and S. Zhou. Solving negotiation problems against unknown opponents with wisdom of crowds. KI 2016: Advances in Artificial Intelligence, Proceedings of the 39th German Conference on Artificial Intelligence (KI), Lecture Notes in Computer Science, Vol. 9904, pp. 126-133, 2016. V. Delage, C. Brandlhuber, K.Tuyls and G. Weiss. Multi-agent based simulation of FOREX exchange market. Proceedings of the 23rd Benelux Conference on Artificial Intelligence (BNAIC). 2011. M. Huhns and G. Weiss (Eds.). Special Issue on Multiagent Learning, Machine Learning Journal. Vol. 33(2-3). 1998. M. Klusch, O. Shehory and G. Weiss (Eds.). Cooperative information agents III. Lecture Notes in Artificial Intelligence, Volume 1652. Springer-Verlag. (ISBN 3-540-66325-8). 1999. K. Klusch and G. Weiss (Eds.). Cooperative information agents II. Lecture Notes in Artificial Intelligence, Volume 1435. Springer-Verlag. (ISBN 3-540-64676-0). 1998. D. Mocanu, H.B. Ammar, M. Taylor, K. Driessens, G. Weiss and Karl Tuyls . Automatically mapped transfer between reinforcement learning tasks via three-way restricted Boltzmann machines. 25th Benelux Conference on Artificial Intelligence (BNAIC, pp. 336-337), 2013. H. Rahmani, G. Weiss, O. Mendez-Lucio and A. Bender. ARWAR: a Network Approach for Predicting Adverse Drug Reactions. International Journal on Computers in Biology and Medicine, Computers in Biology and Medicine, Volume 68, pp. 101-108, 2016. See also here for Web version. B. Ranjbar-Sahraei, S. Alers, K. Stankova, K. Tuyls and G. Weiss. Toward soft heterogeneity in swarm robots. 25th Benelux Conference on Artificial Intelligence (BNAIC, pp. 384-385), 2013. B. Ranjbar-Sahraei, H.B. Ammar, K. Tuyls and G. Weiss. On the prevalence of hierarchies in social networks. 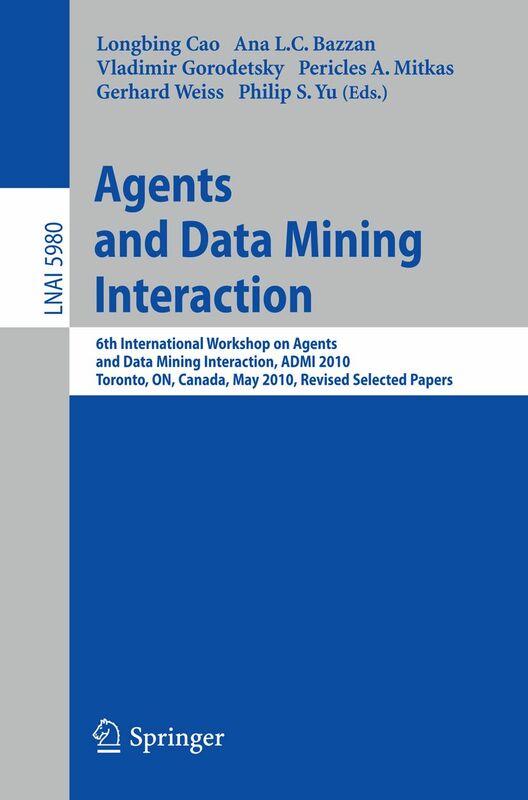 Journal of Social Network Analysis and Mining, 6:58, 2016. M. Rovatsos, M. Nickles and G. Weiss. Interaction is meaning: A new model for communication in open systems. 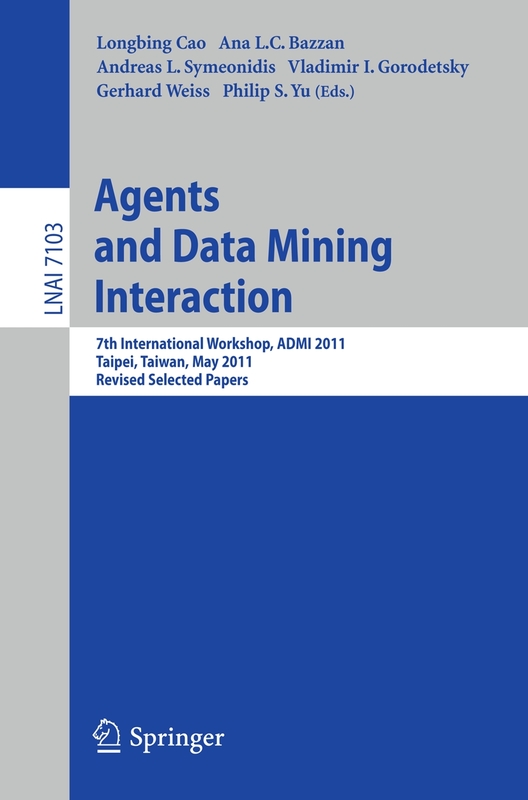 Proceedings of the Second International Joint Conferenceus Agents and Multiagent Systems (AAMAS, pp. 536-543). 2003. S. Sen and G. Weiss. Multiagent learning. In G. Weiss (Ed. 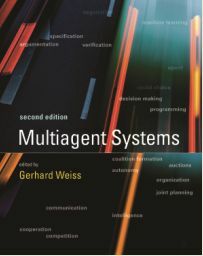 ), Multiagent systems (Chapter 6, pp. 259–298). The MIT Press.1999. G. Spanakis and G. Weiss. Adaptive Moving Self-Organizing Map for Clustering and Visualization. 8th International Conference on Agents and Artificial Intelligence (ICAART), pp. 129-140, 2016. G. Spanakis and G. Weiss. Enhancing visual clustering using adaptive moving self-organizing maps (AMSOM). Volume 10162 of the series Lecture Notes in Computer Science. J. van den Herik and J. Filipe (Eds.). Agents and Artificial Intelligence. 8th International Conference, ICAART 2016, Revised selected papers, pp. 189-211. 2017. G. Spanakis, G. Weiss, B. Boh, V. Kerkhofs and A. Roefs. Utilizing longitudinal data to build decision trees for profile building and predicting eating behavior. International Conference on Health and Social Care Information Systems and Technologies (HCist), Procedia Computer Science, Vol. 100, pp. 782-789, 2016. G. Spanakis, G. Weiss, B. Boh, L. Lemmens and A. Roefs. Machine learning techniques in eating behavior e-coaching. International Journal of Personal and Ubiquitous Computing, 21, 645-659, 2017. G. Spanakis, G. Weiss and A. Roefs. Bagged boosted trees for classification of ecological momentary assessment data. Frontiers in Artificial Intelligence, Volume 285: ECAI2016 (22nd European Conference on Artificial Intelligence), pp. 1612-1613, 2016. G. Spanakis, G. Weiss and A. Roefs. Enhancing classification of ecological momentary assessment data using bagging and boosting. Proceedings of the IEEE 28th International Conference on Tools with Artificial Intelligence (ICTAI), pp. 388-395, 2016. T. Vrancken, D. Tenbrock, S. Reick, D. Bozhinovski, G. Weiss and G. Spanakis. Multi-agent parking place simulation. 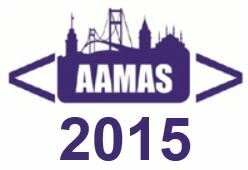 15th International Conference on Practical Applications of Agents and Multi-Agent Systems (PAAMS). 2017. G. Weiss. Learning to coordinate actions in multi-agent systems. In Proceedings of the 13th International Joint Conference on Artificial Intelligence (IJCAI, Vol. 1, pp. 311–316). Morgan Kaufmann Publ. 1993. G. Weiss. Action selection and learning in multi-agent environments. In J.-A. Meyer, H.L. Roitblat, & S.W. Wilson (Eds. ), From animals to animats 2 – Proceedings of the Second International Conference on Simulation of Adaptive Behavior (pp. 502–510). The MIT Press. 1993. G. Weiss. Lernen und Aktionskoordinierung in Mehragentensystemen. In J. Müller (Ed. ), Verteilte Künstliche Intelligenz – Methoden und Anwendungen (pp. 122–132). BI Verlag. 1993. G. Weiss. Hierarchical chunking in classifier systems. In Proceedings of the 12th National Conference on Artificial Intelligence (AAAI, Vol. 2, pp. 1335–1340). AAAI Press/MIT Press. 1994. G. Weiss. Neural networks and evolutionary computation. Part I: Hybrid approaches in artificial intelligence. In Proceedings of the IEEE International Conference on Evolutionary Computation (Vol. 1, pp. 268–272). IEEE Press. 1994. G. Weiss. Neural networks and evolutionary computation. Part II: Hybrid approaches in the neurosciences. In Proceedings of the IEEE International Conference on Evolutionary Computation (Vol. 1, pp. 273–277). IEEE Press. 1994. G. Weiss. Distributed reinforcement learning. Robotics and Autonomous Systems, 15, 135–142. 1995. G. Weiss. Distributed machine learning. Sankt Augustin: Infix Verlag. (ISBN 3-929037-75-0). 1995. G. Weiss. An action-oriented perspective of learning in classifier systems. Journal of Experimental and Theoretical Artificial Intelligence, 8(1), 43–62. 1996. G. Weiss. Several contributions to Wörterbuch der Kognitionswissenschaft (ed. by G. Strube et al. ), Klett-Cotta. 1996. G. Weiss. The job assignment problem: A study in parallel and distributed machine learning. In C. Freksa, M. Jantzen and R. Valk (Eds. ), Foundations of Computer Science. Potential – Theory – Cognition (pp. 445–454). Lecture Notes in Computer Science, Volume 1337. Springer-Verlag. 1997. G. Weiss. Towards the synthesis of neural and evolutionary learning. In O. Omidvar & C. Wilson (Eds. ), Progress in neural networks (Volume V, Chapter 6, pp. 145–176). Norwood, New Jersey: Ablex Publ. Corp. 1997. G. Weiss (Ed.). Distributed artificial intelligence meets machine learning. Lecture Notes in Artificial Intelligence, Volume 1221. Springer-Verlag. (ISBN 3-540-62934-3). 1997. G. Weiss. A multiagent perspective of parallel and distributed machine learning. 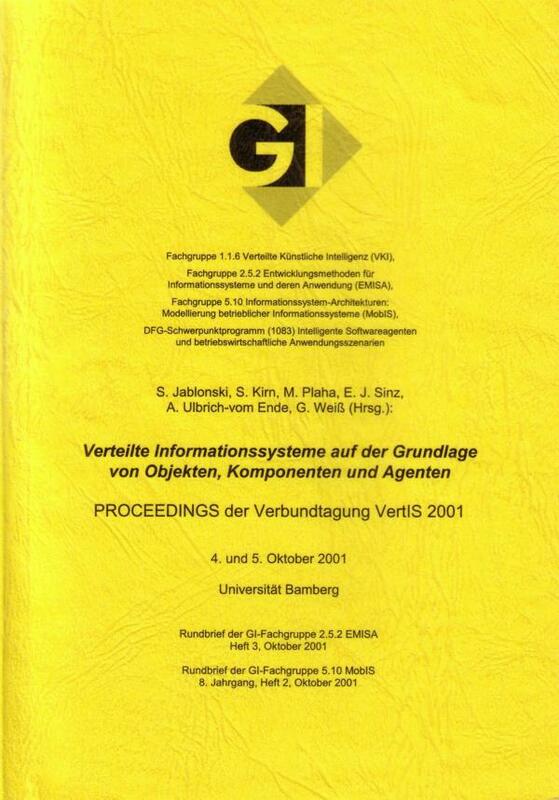 In Proceedings of the Second International Conference on Autonomous Agents (Agents, pp. 226–230). ACM Press. 1998. (Eds. 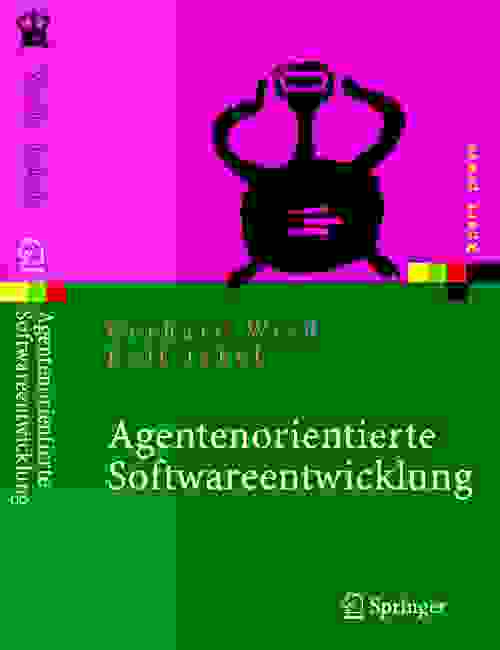 ), Readings in agents (pp. 481–486). Morgan Kaufmann Publ. 1998. G. Weiss (Ed.). Special Issue on Learning in Distributed Artificial Intelligence Systems, Journal of Experimental and Theoretical Artificial Intelligence, Vol. 10(3). 1998. G. Weiss (Ed.). 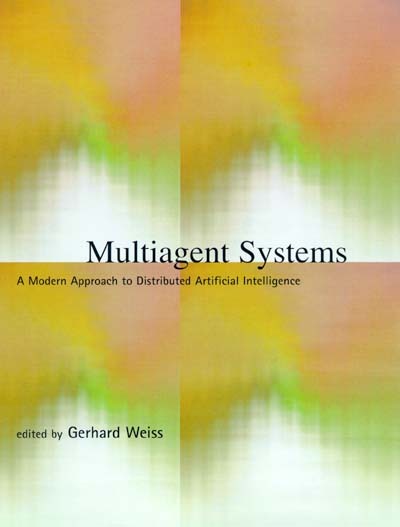 Multiagent systems. A modern approach to distributed artificial intelligence. MIT Press. (ISBN 0-262-23203-0). 1999. G. Weiss and P. Dillenbourg. What is ‘multi’ in multiagent learning? In P. Dillenbourg (Ed. ), Collaborative learning. Cognitive and computational approaches (Chapter 4, pp. 64–80). Pergamon Press. 1999. G. Weiss, F. Fischer, M. Nickles and M. Rovatsos. Operational modeling of agent autonomy: theoretical aspects and a formal language. In J.P. Müuller and F. Zambonelli (Eds. 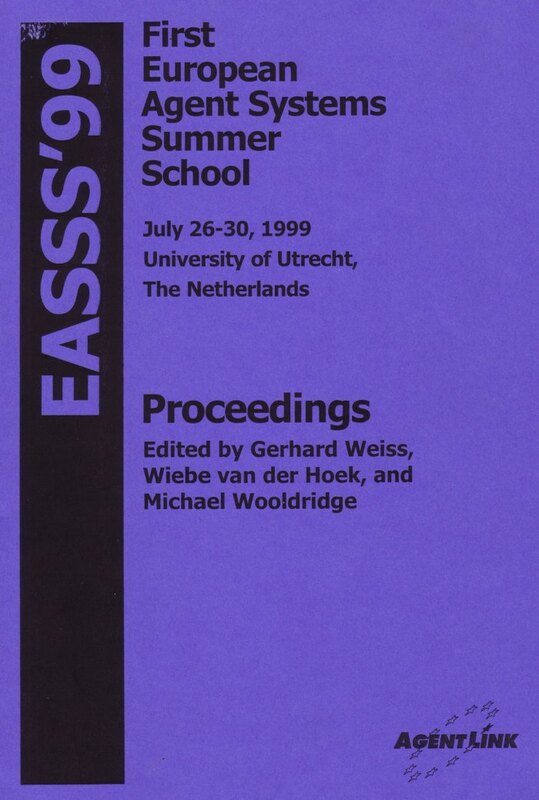 ), Proceedings of the 6th International Workshop on Agent-oriented Software Engineering (pp. 1-15). Lecture Notes in Computer Science, Volume 3950. Springer-Verlag. 2006. G. Weiss and S. Sen (Eds.). Adaptation and learning in multi-agent systems. Lecture Notes in Artificial Intelligence, Volume 1042. Springer-Verlag. (ISBN 3-540-60923-7). 1996.